I love to cook with herbs, but only ever made a big effort to grow basil in the kitchen before. This year i decided I had to try some others. So about 2 months ago, I took some from the herb bed and planted them in a pot, so they could get established before I brought them in. A good plant light is right above them, and the kitchen window gets nice sun for about 4 hours in the morning and early afternoon. I planted some basil seeds, a little sage plant, a sprig of oregano, a little parsley plant, and a rosemary called creeping rosemary, that’s supposed to be pretty easy to grow. All my favorites to cook with. They’ve been in the house about 2 weeks now and seem to be doing well. That is a very popular window with MaChatte, cos she can see out into the side yard. Each cat or rabbit or squirrel outside needs her attention, and she runs from window to window to get another good look at them, sometimes growling, depending on what animal it is. So far, it’s just been a little problem for her getting to one of her favorite windows. That sound you hear is me, knocking on wood now………..
← MaChatte doesn’t know winter will come…….. The light in your house is the most important thing. I have 3 big pots for you to grow herbs in next year outside! Awesome! I have a couple that I’ll be bringing with me as well (from my failed flower attempt last year). I can’t wait to try again. There isn’t much sunlight in the yard over there so we’ll have to make sure you choose carefully where to put things. I’ll have some space for you tho, cos there’s lots of sun and lots of room over here. Those herbs look really nice in that planter. You’re lucky MaChatte has stayed away from them. 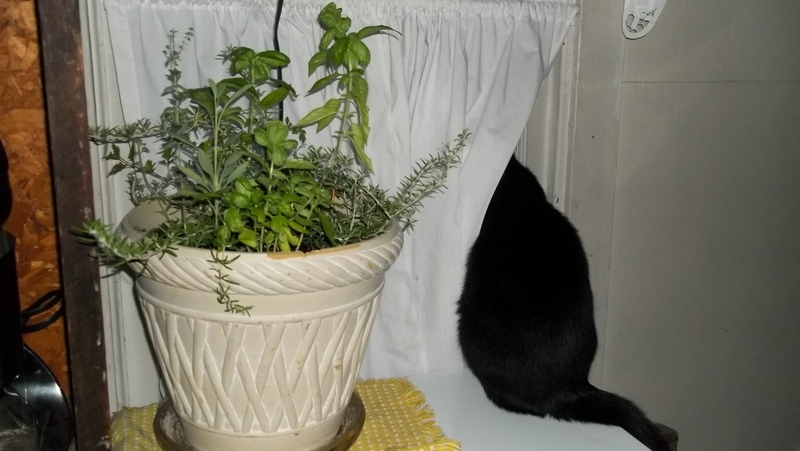 My cats would have had a field day with all of those herbs which is why I don’t bother trying grow herbs inside. Thanks Jackie. I had my doubts about how this would work out but so far………I do grow her some cat grass in the ground in my bay plant, so maybe that satisfies her. Or maybe she tried some of the herbs lightly and didn’t like them, lol. Hey Scott, that’s a possibility I never even thought of!